What does it mean to be an AdvoCare Champion? Regardless of whether you are going against the old you or involved in an organized competition a champion is made through perseverance, work ethic, nutrition, and fitness. There will be set obstacles to overcome and an AdvoCare Champion welcomes them because without this they are just another face in the gym. 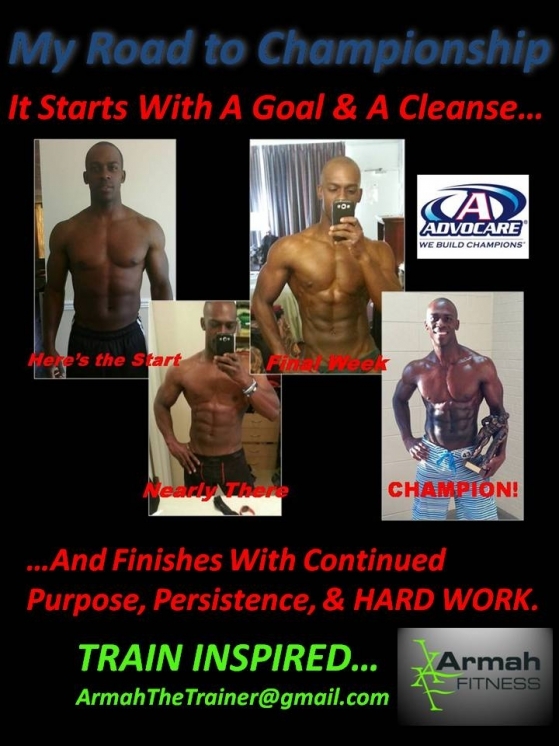 Armah is one of the Superstars that I work with and has been an AdvoCare Champion for over 2 years now. His results are obvious and his continued use has been critical to his success on the Naturals Bodybuilding Circuit. Let me know how I can help you bring out the better you and assist you in creating the results that you want to see.